Vlog, short from video vlog or video log, is a form of blog. As the name suggests, videos are the main content. Everyone can create their own Vlog on a website and posts created videos. In addition, YouTube is the most popular place to publish Vlog posts. To start a good Vlog, high-quality video content is unarguably the crucial part. Moreover, good background music for Vlog can also make your Vlog videos more lively and engaging. To help you find good music for Vlog, this article selects the top 7 sites with massive free Vlog music resources and they all allow you to download Vlog music free. WonderFox Free HD Video Converter Factory is a functional music downloader that allows you to download Vlog music and playlists from YouTube, Facebook, Dailymotion, and other 300+ websites. 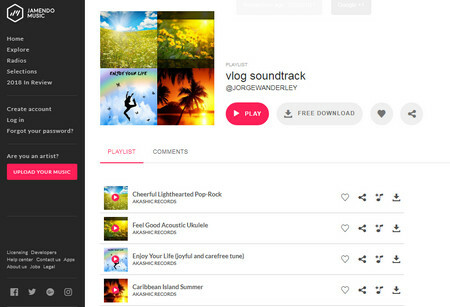 Install it to download free music for Vlogs in a quicker and convenient way. SoundCloud claims to be the world’s largest open audio platform and it absolutely deserves it. The website owns massive music resources distributed and shared by audio creators. Apart from copy-protected music, it also offers free stock music for users to download and use. 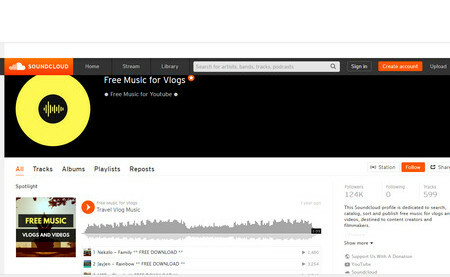 And all the audio tracks in the Free Music for Vlogs category are available for download. Moreover, it has no registration requirements. If you want to quicken the SoundCloud download process, you’d better use a third-party music downloader to download the music using URL since the built-in download option on SoundCloud is a little tortuous. WonderFox Free HD Video Converter Factory is useful for free Vlog music download. 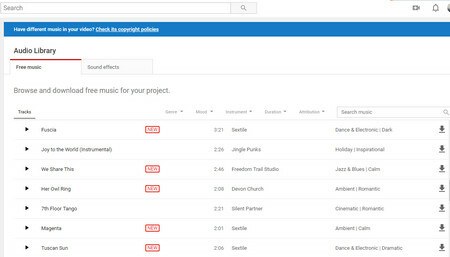 YouTube has a built-in audio library for users to download free music and sound effects for their own project. You can directly scroll down the slider on the right to select the audio you want to download and click on the Download icon to save the audio to your computer. In addition, you can make use of the navigation menu. The audio tracks are classified into Genre, Mood, Instrument, Duration, and Attribution. The quick search bar can also help you to find background music for Vlog at one go. Jamendo is another popular music website gathering many independent artists and music lovers. This website is wildly remarked for its high-quality music resources, massive free audio tracks as well as the modern and well-organized interface. You can download plenty of free background music for Vlogs after logging in. However, you can only use its royalty free music for personal purposes. If you need to use audio tracks from Jamendo for business Vlogs, you need to purchase the license. Bensound provides the royalty free music with various genres like acoustic/folk, Cinematic, Pop, Electronica, Jazz, Rock, and so forth. All the audio tracks with the black download button are under the Creative Commons License, which means that you can use the music in online videos, websites, animations, etc. 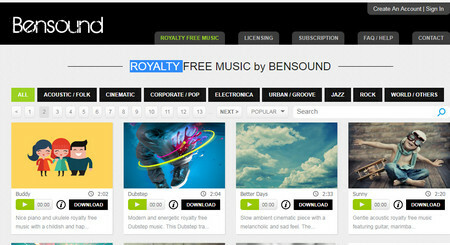 It must be noted that you need to credit Bensound.com when you use its music for free. Moreover, you can buy a Bensound Pro Licence to download high-quality MP3 files and bypass the requirement of crediting Bensound. 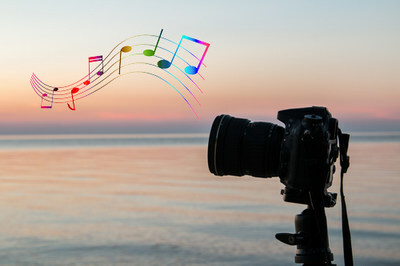 Free Stock Music enables you to download MP3 and WAV audio files free and most of the royalty-free music downloads are released under Creative Commons Licenses so you can use those audio tracks for your Vlog and even for commercial purposes as long as you include the music info credit in your video description. There are many types of music for you to select from. 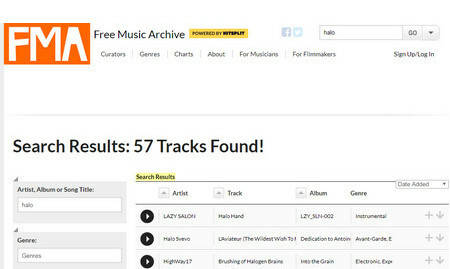 You can also search for a keyword of music to find the needed one. On AShamaluevMusic, you can free download 320 kbps MP3 music for non-commercial uses. But if you want to use its music on YouTube and other sites for business intentions, you need to buy a license. 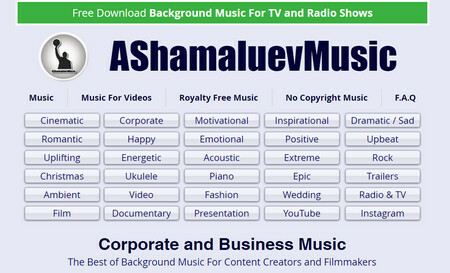 AShamaluevMusic has different kinds of audio tracks and is a good place to download instrumental background music for corporate and business projects. If you want to download free travel vlog music from a website yet there has no download option or the download process is tedious, you can use WonderFox Free HD Video Converter Factory to download the music using URL. The music downloader supports videos & songs download from YouTube, SoundCloud, Facebook, Dailymotion, and many other websites, and the process is easy and fast. WonderFox does not advocate downloading copyright content from the Internet for commercial purposes and other illegal intentions. This guide is for personal use only. Open WonderFox Free HD Video Converter Factory. Click on the Download Video button, and copy and paste the music URL into the Add URL box. Click on the Analyze button and it will quickly analyze the music URL. After the analysis process, click on the Download button to download the background music for vlog to your computer. Tips. If you want to extract the background audio from a video, just click on the Output Format button on the right of the main interface, select MP3 under the Audio tab and click on the Run button on the lower right corner to convert the video to audio. 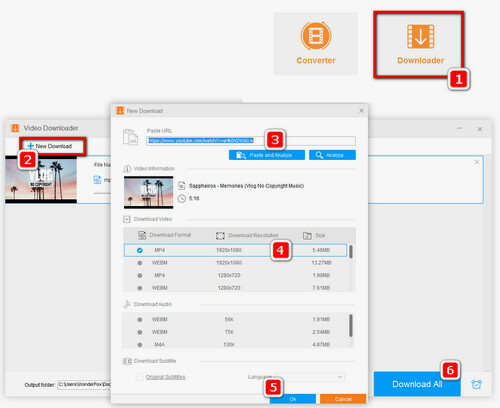 Free download WonderFox Free HD Video Converter Factory and download videos and audio from sites using URL.